A pair of EMTs had something extra special to celebrate during the NYC Pride March yesterday when one proposed to her girlfriend during the festive march. (She said yes). 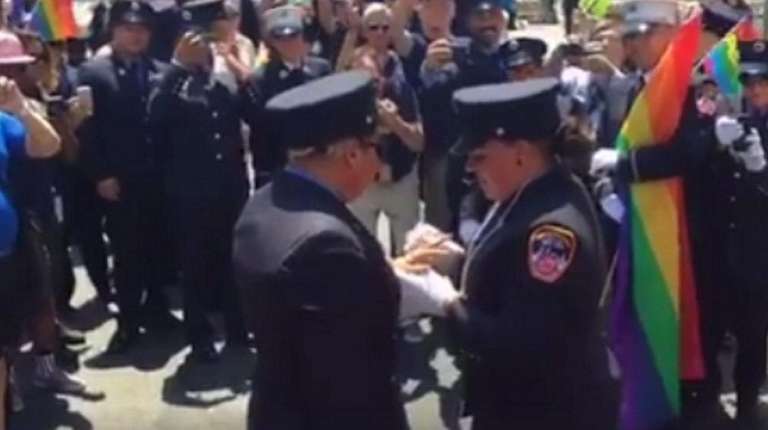 Julianna Arroyo, from Station 20 in the Bronx, was surrounded by friends and family when she got down on one knee and proposed to her now-fiancee Erika Marrero at the parade. When Marrero said yes, the couple embraced and kissed as onlookers — some in uniform and holding rainbow pride flags — cheered. The proposal was captured on video and someone can be heard telling Marrero to “say yes.” The video was then posted to the FDNY’s Facebook page.